I'm not quite sure what to make of the sudden rash of analysis regarding money and the NCAA. On the one hand, it's surely an important issue worthy of our concern. On the other hand, this is not exactly recent news. The income disparity between the NCAA and collegiate athletes has been around for quite some time. If I give the media cycle the benefit of the doubt, perhaps we can pin the recent chatter to the fact that some 11 months ago, the broadcasting rights for the men's basketball tournament were sold for some $10.8 billion. Perhaps last April was the proper time for all the college basketball analysts to collectively navel gaze, but that ignores the plethora of "Gone Fishin'" signs hung by said analysts after all the nets are cut. But before I delve into the subject, I insist that everyone reading this go read what John Gasaway wrote on the subject just yesterday. Go on, read it. I'll wait. Gasaway makes many points, but the biggest one seems to be that while the NCAA hauls in quite a bit of money, it gives back the vast majority of that to the schools in the form of hosting other non-revenue championships as well as outright distributions. This is an important point for those who want to hold the NCAA accountable as a solitary bad actor. 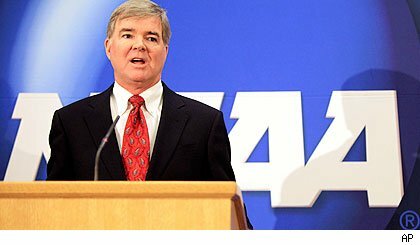 The NCAA's offices in Indianapolis is not some skull-carved lair and as far as I can tell Mark Emmert does not have mustache he curls as he hatches evil schemes. To the extent that the NCAA is guilty of anything, that guilt must also pass on to the schools. One complaint going around seems to be that the NCAA has erred by making lots of money off of the student-athletes. Frankly, this does not make sense. Surely, it's obvious to everyone that the NCAA has to make money. The organization does a lot of things--hosting other tournaments, for one, and also for going all Eliot Ness on athletes accepting cash (more on that in a bit). Once we accept that the NCAA has to make money, I don't understand the complaint that it tries to make as much as possible. This is a non-profit organization, after all, it's not like Warren Buffett is lining his pockets with TBS dough. While some NCAA employees are highly paid, that's really a debate about non-profits generally. And believe me, that debate exists, and it's been going on for quite some time. All of this is to say that the NCAA is not unlike other non-profit organizations, in that the ethical lines of executive compensation make us squeamish. The bigger complaint, however, is that student-athletes are not allowed to capitalize on their talents in a commercial manner. This is where things get interesting. The characterization on this state of things is that the NCAA is "greedy." Once again, this makes no sense. The NCAA did not investigate Reggie Bush in the hopes of collecting his cash. The organization is not acting as a crooked intermediary between the agents and the collegiate players. While there might be a limited possible exception* to this, generally speaking, the NCAA is not made richer vis-a-vis outlawing student-athlete compensation. On that topic, it's worth noting that Gasaway has previously argued for the student-athlete right to seek compensation. Morally, there's absolutely nothing wrong with Gasaway's argument. In fact, student-athletes are getting paid, right this very second, but yet I anticipate many fans will nonetheless tune in to watch this weekend's championship. For alumni of the school that wins it all, it will be one of the happier moments of their lives. The sport isn't tarnished because athletes cash some checks. It may, however, become tarnished when the penalty for rule-breaking pounds once-proud programs into the ground. I suspect, however, that Gasaway knows better than believing that because the ethics are workable, that the solution is as well. After all, if allowing student-athletes to make some money did not make the NCAA (and by extension, the schools) any worse off, then why not let them? Mark Emmert does not need the headaches of being attacked by Frontline and HBO, to say nothing of being defended by Gregg Doyel. So why hold out? Moreover, the NCAA seeks to market a particular brand of football -- college football. The identification of this "product" with an academic tradition differentiates college football from and makes it more popular than professional sports to which it might otherwise be comparable, such as, for example, minor league baseball. In order to preserve the character and quality of the "product," athletes must not be paid, must be required to attend class, and the like. And the integrity of the "product" cannot be preserved except by mutual agreement; if an institution adopted such restrictions unilaterally, its effectiveness as a competitor on the playing field might soon be destroyed. Thus, the NCAA plays a vital role in enabling college football to preserve its character, and as a result enables a product to be marketed which might otherwise be unavailable. In performing this role, its actions widen consumer choice -- not only the choices available to sports fans but also those available to athletes -- and hence can be viewed as procompetitive. To give some background, this excerpt from the Supreme Court came within one of the many antitrust challenges that the NCAA has been fighting off for decades. When you have a collection of entities that decide to join together, make some money, and agree between themselves how to limit employee compensation, you're going to get some antitrust challenges. Further, when it comes to marketable collegiate sports, the NCAA is the only game in town. To be sure, the NCAA is not alone in this behavior. Take a look at the professional leagues, what with their salary caps, rookie payscales, and luxury taxes. All of these instruments are simply a means to limit employee compensation. The preferred antitrust loophole for these leagues is the collective bargaining exception. Because there exists a players union, we'll allow the anticompetitive behavior to continue. The thinking is that so long as the employees have a voice in these matters, they will be treated fairly. Meanwhile, there is no collegiate players union. In the absence of this, the Supreme Court carved out an exemption based on the idea that so long as collegiate sports was primarily an educational endeavor, then it was subject to less antitrust scrutiny. And in order to make collegiate sports more "collegiate" and less "[commercial] sports," we need the NCAA out there cracking down on player kickbacks. To use the parlance of my industry, this is a legal fiction of the highest order. The takeaway on all of this is that so long as the NCAA is out there busting down doors to ensure that players aren't paid, then antitrust challenges from players will be less successful. In other words, if the NCAA started allowing the Kemba Walkers of the world to accept cash advances from agents, it risks lawsuits from high school players who complain that the NCAA's rules will not allow their prospective colleges to pay them in exchange for a verbal commitment. In this scenario, money _would _be taken from the NCAA (remember, that's the schools) and given to players. One would expect that John Calipari's recruiting budget would have to expand quite a bit, and that certainly would come at considerable cost to Kentucky. That's the problem I have with the problem with amateurism. It's an attempt to leave Pandora's Box slightly ajar. Mind you, I don't necessarily advocate the regulatory framework we're working within, but it's a fool's errand to try and undo three decades of litigation. So what's the solution? Well, one plausible strategy is to look at who is actually getting rich (with all this money, someone must be), and thinking of how to divert some of those dollars to the players. The prime candidates would seem to be the coaches, with their multi-million dollar salaries and shoe endorsement deals. Alas, restricting those salaries is illegal too. I leave it to others to query how it can be legally problematic for schools to either allow player compensation or restrict coach compensation. Alas, there is no solution that I think will satisfy everyone. However, there are some things the NCAA can do. For one, it can make sure that kids like Joseph Agnew are not cast aside in the future. Just as player compensation would not be toxic from a moral standpoint, multi-year scholarships will not grind the Earth's rotation to a halt. And sure, it would be nice if the player's families were given assistance to travel to more of their kids' games. And the players' budgets are a bit thin--why not give just a bit more to these kids so that they're not living like poor college kids on top of going to practice all the time? Sure, I was once a poor college kid myself, but I also spent many afternoons napping on the quad or drinking on a sun deck. And hey, to Emmert's credit, he's thinking about doing some of that (compensating players, that is. Not the drinking at inappropriate times.). The NCAA (and by extension, the member schools) is not greedy nor evil. The structure and rules of the NCAA are not perfect, and unless some enterprising lawyer takes on Supreme Court precedent, they likely never will be. But we can do better. And we should. The possible exception being in the form of naming rights for video games and such. Conceivably, a video game maker would have to pay the NCAA as well as the hundreds of athletes depicted in its game. More practically, the more efficient means would be for the NCAA to collect all the money and then cut checks to the players. This still doesn't really solve the complaint that the most marketable athletes are subsidizing others, however.